As a boy, I learned a hard lesson about life and death. BACK STORY: In the 1950's, a great deal of sand was dredged up from the mouth of the Bayou Chico, near Pensacola, Florida. Some of this sand was used to make a "peninsula" of sorts, upon which a chemical company installed the gas tanks shown in the picture I took somewhere around 1970. The dredged up sand, and resulting "gas island" as it was sometimes referred to, made a great habitat for seagulls, who would lay their eggs in the sand. It also made a hunting ground for at least two destructive boys, who were just on the edge of learning the difference between life and death. 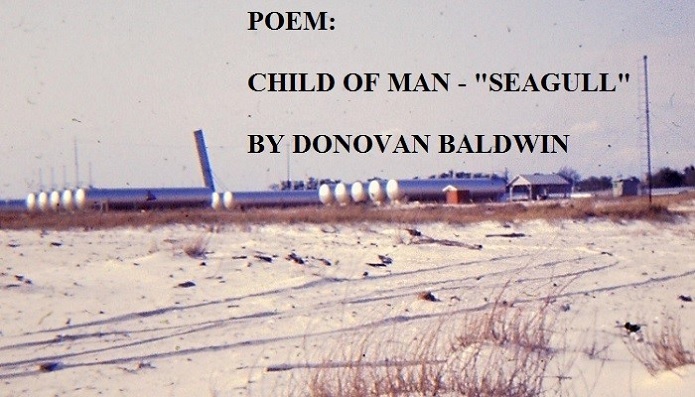 The following poem was written many years ago as I thought about those days, and those birds and their eggs. Note: If you enjoy this poem, please take a moment to share it with one of the buttons to the left. You are not welcome, child of man. You've smashed our eggs hid in the sand." Blinks as his eyes brush past the Sun. Holds and squeezes...down falls one. He runs to see what he has done. "Now gone a year, and gone a friend. The tale unfolds without an end. But, others come to hunt again." The eyes are closed, the bird is dead. There comes, then goes, some unnamed dread. As from us they learned to sail the sky. Who sometimes learn to heed our cries"